Clean Water Portland is a volunteer-run truly grassroots political action committee. 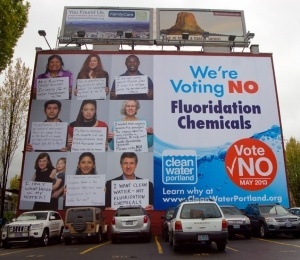 We are made up of Portlanders from all walks of life with a common dedication to protecting Portland’s people and world-class drinking water from the risks of fluoridation chemicals. After a minimal public process, in September of 2012 the Portland City Council voted to add fluoridation chemicals to our drinking water. But here in Portland, we can refer a City Council ordinance back to a vote of the people if we collect enough signatures within 30 days. Thanks to incredible volunteer help, Clean Water Portland collected over 44,000 referendum signatures in 29 days and qualified the Portland City Council’s decision to fluoridate Portland’s drinking water for a public vote. That’s us delivering the signatures to City Hall up there in the photo! If you live within the city limits of Portland, the issue will be on your ballot this May 2013.